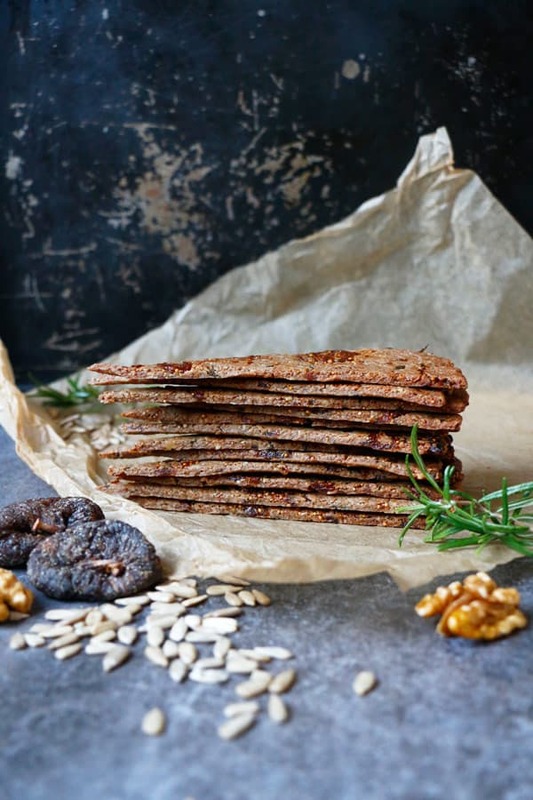 I’ve got another yummy recipe for the party season for you – Fig Walnut Rosemary Crackers. 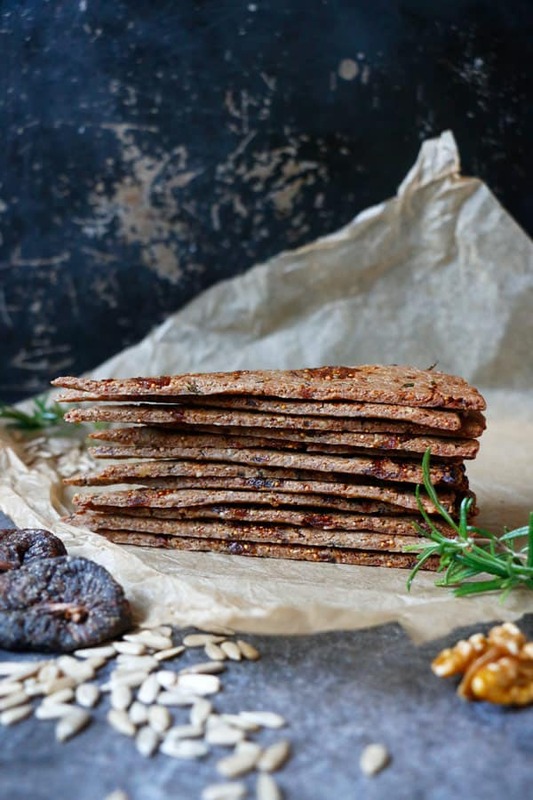 They are everything crackers should be, crispy, full of flavour and so moreish. I could not stop myself eating them! 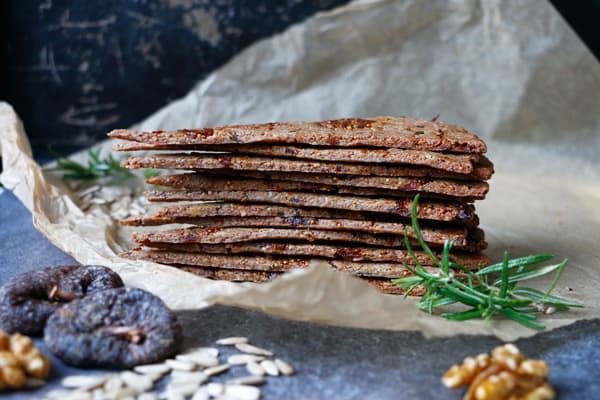 Inspired by my ever so popular Buckwheat Rosemary Crackers these are much more nutty and just as amazing. Only missing some cashew cheese to dip in. Mix the ground flaxseed with water and set aside to thicken. Place walnuts and sunflower seeds (you can do this separately) into food processor or blender and pulse until finely ground. Scoop into a mixing bowl. Add quinoa flour, rosemary and sea salt and whisk well together. Stir in olive oil followed by flax egg. Bring together into a dough, if needed add in extra water by tsp and blend in chopped figs. The dough will feel slightly wet and oily. Shape the dough into ball and place onto a baking paper. Using rolling pin roll out into circle until about ¼" thickness. Be patient with the dough, it will crack because of the figs, just use your hands to shape it and push back together. Using pizza cutter cut the dough into 16 wedges like you would cut a pizza. Carefully transfer onto a baking tray with the baking paper. Bake for 15-18 min until golden brown. Amazing as always!! I wonder if I could substitute coconut flour or almond meal for the quinoa flour. Any thoughts? Thank you. Hana, These were amazing!! I had to fight my 8-year old for the last crumbs! Will have to make some. Thank you. I stopped buying boxed cracker long ago…so tired of reading the horrific ingredients. It’s about time I try my own and this will be my first shot. Happy feasting! These are beautiful and right up my alley. What a great gift they would make, too. Thanks! Thank you so much Coley! Yes, they would, I’ve gift wrapped them for a little sale I was doing with some of my friends and they looked fantastic! HI! Do you thing I can substitute quinoa flour for ground pepitas (pumpkin seed meal)? Thanks. Hi Katja, I think it should work. 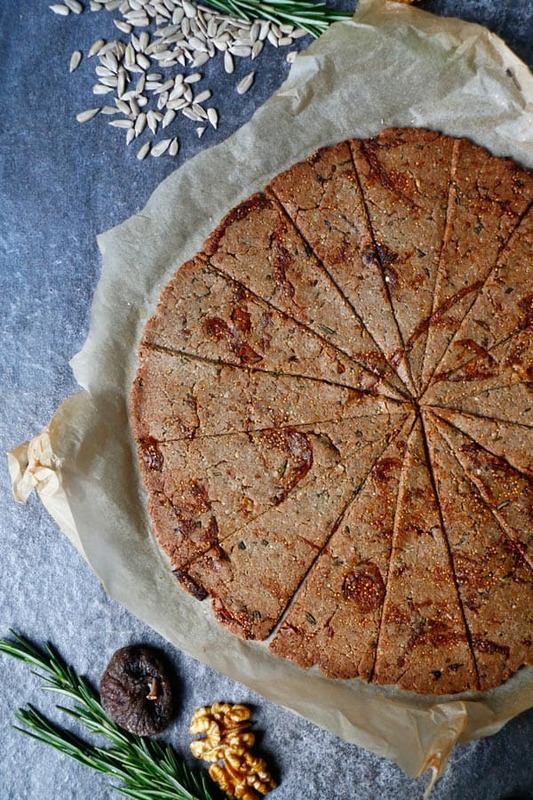 You might need little more than the quinoa flour, just see how the dough feels once it comes together. 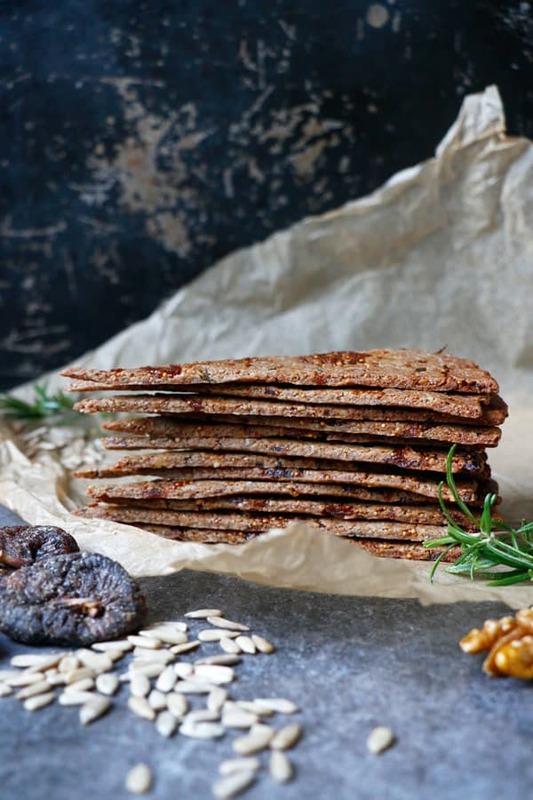 I made these Fig Walnut rosemary crackers and Hmmm… where did they go!?! They are so good! Earthy flavors with the sweet textures of fig. They store well too. 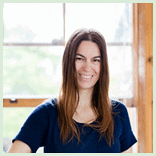 Hi Miranda, thank you so much for leaving such lovely comment! I had the same problem :) gone too fast! I tried these crackers today. I used amaranth flour instead of quinoa flower (which is horrendously expensive here in Switzerland!) which I think works just as well. I like the taste of the crackers, the rosemary and the figs go well together I find. My issue was – at least so I think – that the dough was not thin enough so the crackers are not crunchy through the middle. Also, they didn’t brown as nicely as the ones in your pictures. Any idea why? I enjoyed these. I added a few more figs and cut them into squares so I could top them with goat cheese and a dab of honey. I’ll be saving this recipe!